Yesterday marked my first blogiversary, here at Jack of all craft. A whole year occupying this little corner of the crafting world. I’m not sure I really thought I would get this far when I first started out, so it feels like quite an achievement. Blogging encourages me to craft more, and crafting encourages me to blog. It’s great to document the process and be able to look back on everything I’ve created over the last year, and see the progress I’ve made with knitting especially. Thanks to everyone who has read and commented on my posts – I love hearing from you, and I really enjoy reading and learning more from your blogs too – they inspire me and challenge me to try new things. As it was a special occasion, I thought I would treat myself by casting on something new. These will hopefully become a pair of socks for me! I only have a small 50g ball of yarn, so I’m not sure how far it will go. I’m hoping for trainer-socks at least.There is a possibility they may have to be frogged and re-knit into a smaller pair of socks for one of the boys, but for now I’ll keep going and see where I get to. 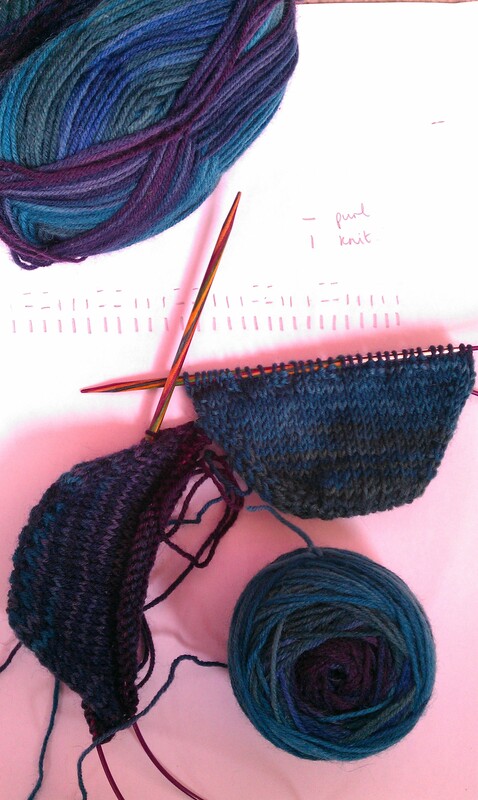 I’ve never worked with variegated yarn like this, so it’s exciting to see the different colours emerging as I knit. I’m kind of making the pattern up as I go along, using bits of patterns from different places. 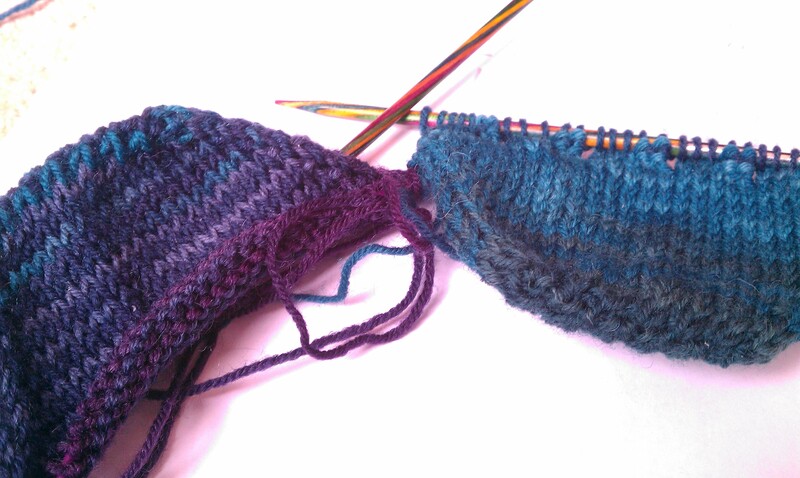 I started with a cast-on method I found at Silver’s Sock Class, which is what I’ve used previously. I wasn’t keen on the heel method I used before, so I wanted to have a go at the heel-flap construction I’ve heard Cassy talk about at knitthehellout. 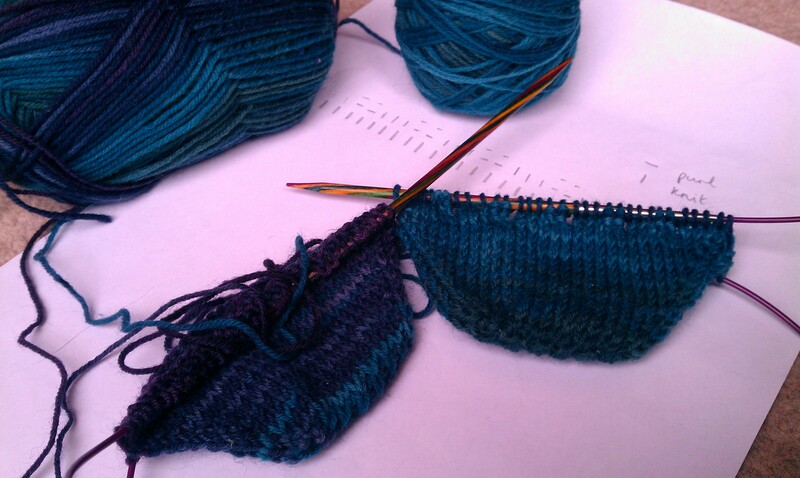 In fact, I’m using one of Cassy’s patterns, Earlybird, found over at Knitty.com for the toe and heel directions. I can’t do the cable pattern, as I’m pretty sure it’ll eat way too much of my yarn, so I’m doing my own thing on the instep, with a bit of 3×2 rib. I’ve never worn handknitted socks, so I’m excited to see how they turn out! So, happy new year to you all! Let’s see what this one will bring. Normal services appear not to be resuming. I’ve not picked up a crochet hook or knitting needles for a good couple of weeks now. The mega-cold has at least subsided at long last, though Pickle did indeed come down with chicken pox at about the predicted time, so illness accounts for the break to a certain degree. We’ve also been away, spending time with family and celebrating various family birthdays. I had grand ideas for a birthday cake for Pickle. He’s very into diggers at the moment, so I thought something along those lines would go down a treat. Unfortunately, given he was poxy and I was still under the weather, we had no guests to help us celebrate and eat a huge cake, so I went for something much simpler and baked some simple cupcakes with the boys in the afternoon. 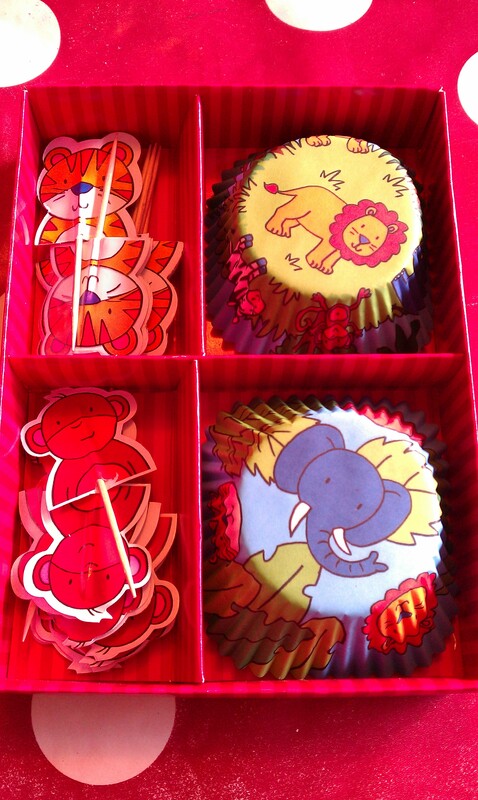 I dug out some fun cupcake cases and toppers, and they enjoyed helping with the weighing and stirring, and sticking the toppers in at the end. I also made a cake for our family gathering and my mum’s birthday celebration, but utterly failed to take any pictures of it, so you’ll just have to imagine it – think ‘death by chocolate’ and you might be close! I’ve definitely hit a road-block in my knitting. I’m determined to get my cardigan finished before I start any new projects. I only have the button-hole band left to do. I know it will be pretty straightforward once I actually get going on it, but somehow, somehow I just can’t bring myself to pick it up and work on it. The pattern doesn’t give any instructions on how to make the buttonholes, or how to space them, so I think I’m stuck on that. I’ve looked up various tutorials online, but am still unsure how to go about it. Any suggestions gratefully received. I really want it done so I can start a new project! I’ve also been a little distracted by other things – the nice weather has drawn me outside much more recently. Pickle loves to be outside, so we go out in the garden, or off to the park as often as we can. 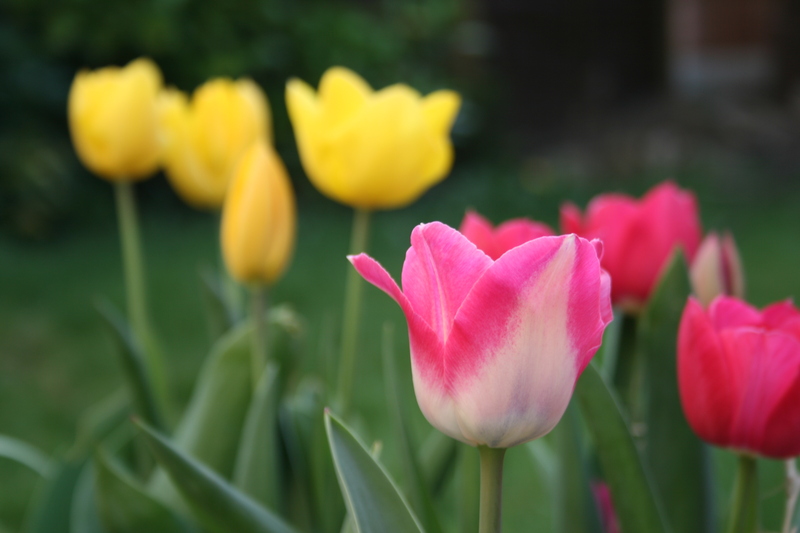 Just look at my beautiful tulips! they make me happy. I am also going through a reading phase at the moment. I absolutely love to read, but don’t find the time to do it so much these days. Grown up responsibilities and other hobbies have a habit of getting in the way! So I tend to go through phases where I’ll read several books in quick succession, and then nothing for several months. Recently I’ve read Stardust by Neil Gaiman, and I’m working my way through the Nikki Heat series by Richard Castle, which are a tie-in to the TV series ‘Castle’ that my husband and I are watching. I’m not much good at writing reviews, suffice to say we love the series and the characters, and the books work really well alongside the TV show. I’d recommend checking it out if you don’t know it. I’m up to book 6 in the series, which I think is the last one that’s available at the moment, so I’ll probably reach the end of my reading phase with the end of this book, and then go back to knitting so I actually have something to show you again. What other hobbies do you have that distract you from your knitting? Circumstances have conspired to put crafting on a temporary hiatus here at Jack of All Crafts. Show week coincided with Pumpkin’s last week of term at school, which meant I was pretty much run off my feet. I usually bake a few cupcakes for my fellow castmates and crew, but between rehearsals, shows and usual term time activities, and attending all the end of term assemblies and fundraising events at school, I didn’t have the time or energy to manage even a small batch. Pumpkin came down with chicken pox on the Saturday of the show, so the plans we’d had to go out and do things with family who were visiting rather fell by the wayside. A couple of days stuck at home with the small people had me feeling a bit cooped up and restless, but then I was struck down by the mother of all colds, and have pretty much been in bed or on the sofa feeling just awful ever since. I’ve never known anything like it! I think I’m on day 5 or 6 and it’s showing little sign of letting up. I’m almost reluctant to call it a cold, because that makes it sound so trivial, when it’s more like some kind of evil mutant megacold. I’ll spare you the details! I managed only a couple of rows of knitting over the weekend. Mostly, just managing to breathe has been an achievement in itself. Being unable to do much other than thinking, has left me mulling over ideas for Pickle’s birthday cake. I have a vague plan in mind now, but given that it’s his birthday next week and I have nothing planned as a celebration and am a little reluctant to commit to anything as I fear he may also be down with the pox around then, vague is as far as it gets. Oh dear. Here’s to hoping normal service might resume soon.